US troops went into Vietnam. MAX HASTINGS saw them humbled by an army of peasant fanatics amid horrors that haunt him to this oday. Operation Popeye was a highly classified weather modification program in Southeast Asia during 1967–1972. The cloud seeding operation during the Vietnam War ran from March 20, 1967 until July 5, 1972 in an attempt to extend the monsoon season, specifically over areas of the Ho Chi Minh Trail. The operation was used to induce rain and extend the East Asian Monsoon season in support of U.S. government efforts related to the War in Southeast Asia. Four US Marines who fought in the Vietnam War showed up in Palm Coast, Florida on Saturday to take a picture. A picture that was 50 years in the making. The White House confirms reports that, at the request of South Vietnam, the United States is sending two battalions of U.S. Marines for security work at the Da Nang air base, which will hopefully free South Vietnamese troops for combat. On March 1, Ambassador Maxwell Taylor informed South Vietnamese Premier Phan Huy Quat that the United States was preparing to send 3,500 U.S. Marines to Vietnam. Three days later, a formal request was submitted by the U.S. Embassy, asking the South Vietnamese government to “invite” the United States to send the Marines. Premier Quat, a mere figurehead, had to obtain approval from the real power, Gen. Nguyen Van Thieu, chief of the Armed Forces Council. Thieu approved, but asked that the Marines be “brought ashore in the most inconspicuous way feasible.” The Marines began landing near Da Nang on March 8. A U.S. 9th Infantry Division soldier of the 2nd Battalion, 60th Infantry, takes advantage of a stream in the Mekong Delta of South Vietnam to cool off while cleaning his weapon, June 1969. 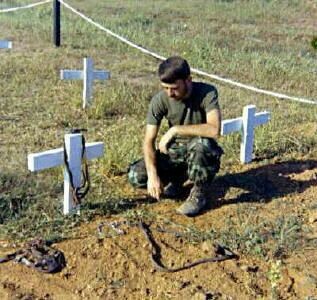 ~ Vietnam War.